Searching for a leading pest control service provider? Pest Ban is your true destination. We are a team of professional pest controllers having years of experience and deep knowledge in the field. We understand that pest problems make your home as well as life hell. You need to treat them in the most effective manner, so your family and pets stay safe, and professionals like us do a wonderful job for the same. Whether you are pissed off from ant infestation in your kitchen or rodent infestation in the entire home, our professional pest controllers can help you in the safest and cost-effective manner. We also provide no obligation free quote for our pest control services, so call us @ 1800 441 506 or reach us online for same day booking. We at Pest Ban offer a range of affordable pest control service in major australian cities. Also, unlike others we do not sacrifice on the quality and that is what make us different from the rest. So, when you are looking are looking for an affordable and quality pest control company, do not look any further. Another major aspect that make us famous in the field is our easy accessibility. 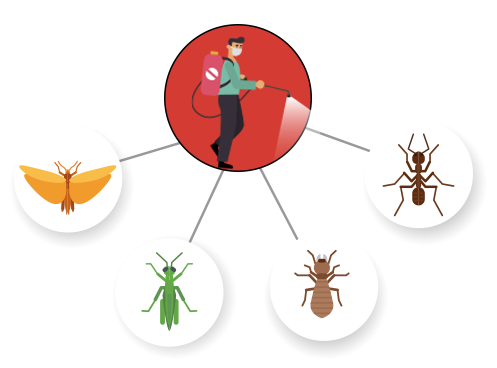 We at Pest Ban know that pest infestations can create a havoc around the home and you need urgent treatment for it. You can avail our pest control services on the same day of booking as well as on weekends. Quality service is something our Pest Ban never compromise on. The professionals pest controllers of our company, know that quality services means safe results. We are equipped with advanced tools and eco-friendly chemicals in our pest control methods. So, wait no more and avail us for same day pest inspection. We offer our pest control services across all the suburbs of below-mentioned cities. Have a look at our database in different cities. Dial our toll-free number or reach online for the same day booking.